For a while now I have tried to resist the vegetable noodle trend. I didn’t want to buy another kitchen gadget that would just take up space and collect dust. But then my sister’s awesome boyfriend bought me a spiralizing tool (which I’ll be reviewing soon), and just like that, I hopped on the bandwagon. I love real pasta more than anyone, but I’m just old enough to realize that eating vegetables is an important part of being a *functioning* adult. 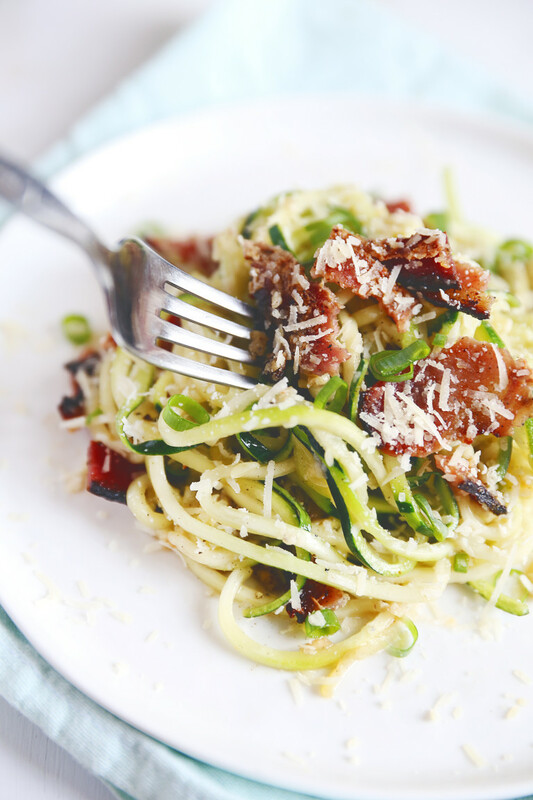 This recipe plus a number of others that I’ve been experimenting with make it super easy for me to get at least two or three vegetable servings packed into one meal (let’s just let the bacon and cheese part slide for now). Since this is a simple dish, I really made sure to prioritized the quality of my ingredients. 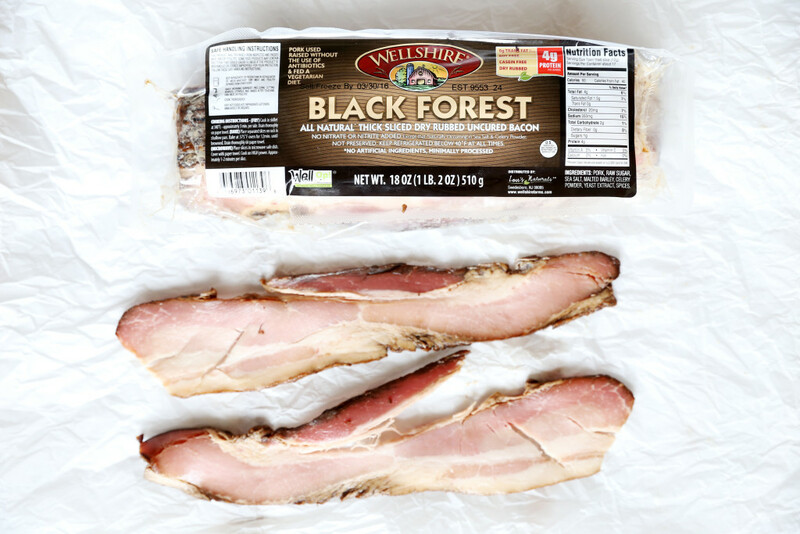 I picked up this hoity-toity bacon from Whole Foods, and it’s actually worth the outrageous number of dollars I handed over for it. 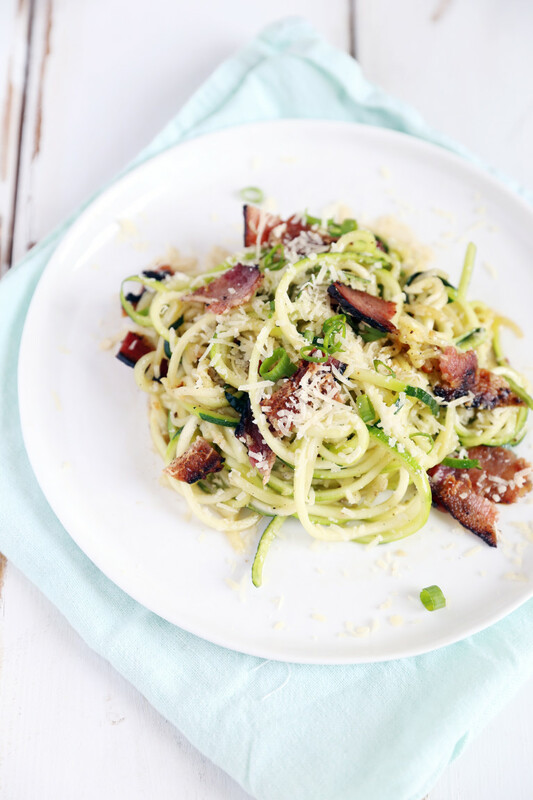 Hand to heart, this recipe seriously won’t even have you missing carby pasta goodness. I’m not over exaggerating this. I wouldn’t lie to you like that. If you’re still iffy about dropping $40 on one tool — I applaud your practical money skills — there are some cheaper options you can try like this and this. Place a large skillet over medium heat and coat lightly with cooking spray. Add in the bacon and cook for 3-5 minutes and then flip over, cooking for another 2-3 minutes. Once done, remove and place on a paper-towel lined plate. Remove all of the oil from the bacon except for 2 tbsp. Add in the garlic and red pepper flakes and cook for 30 seconds. Then, add in the zucchini noodles and toss to cook, for about 2-3 minutes. Season the zucchini with about 5 cracks of the pepper and add in the cheeses. Toss to combine thoroughly. 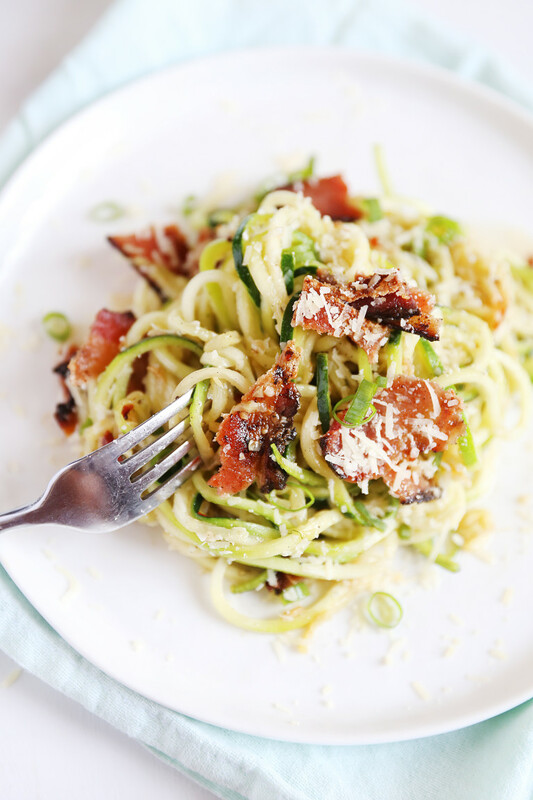 Crumble bacon into pan of zucchini noodles, then plate.